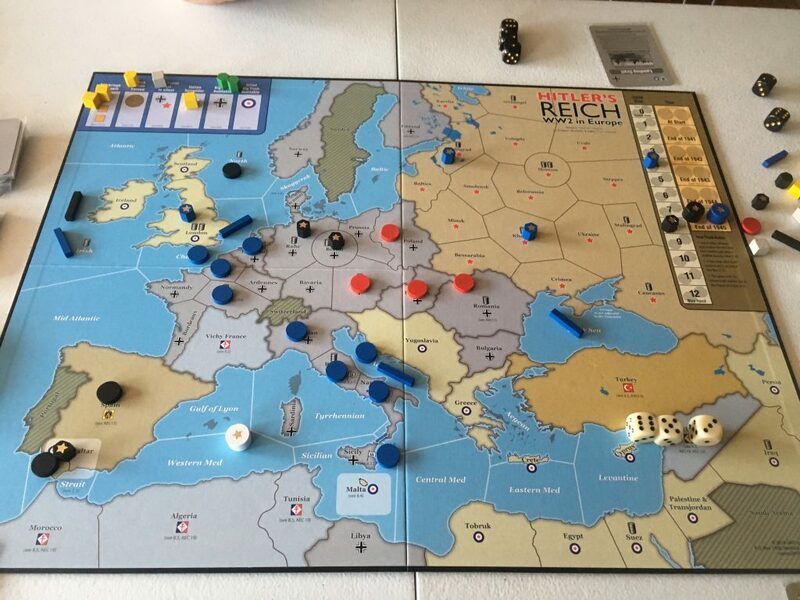 On our last monthly gaming day, I had a chance to play Hitler’s Reich by GMT. It is the first of a new system of games called the Card Conquest System. It is a light wargame that covers the European Theater of WWII from 1941 to 1945. I have played the game three times now (two and a half, really) and I wanted to give my thoughts. The setup time is amazing. Starting from when you take the box off the shelf, you can be playing in less than 5 minutes. The map is basically pre-marked with the 1941 setup and you only need to prepare a few cards to get going. The mounted board is well made and there are rule references in many places on the board itself. This also contributes to the ease of setup and play. The basic combat mechanic is simple and consistent – 3d6 plus the value of the card that you play. There are modifications, but most combat is just that. The game is fun and keeps its promise of being WWII in two hours. The rule book is not good. Seriously. Even GMT has admitted this to be so. If you want to play, get the fan made rule book from BGG. This is definitely not a simulation. Not necessarily a con, but you should know what you are getting into. This is a beer and pretzels game. In the three games I have played, North Africa has never come into play at all. There is very little reason to do so, despite it being on the map. If you hate dice games, you will at times get frustrated by this one. There are plenty of ways to modify die rolls, but they can still betray you. Overall, I like the game. The quick setup and low complexity will help it get to the table more. It is a solid 7/10. In my last game, the Allies squeezed out a notional victory. We never took Berlin, but we crippled the Axis production power.